Next to a home purchase, sending your kids to college may be the biggest expense of your lifetime. And like all things money, this one is easy to screw up. Whether you’re still saving or you’re right up against tuition payment deadlines, make sure you avoid these costly mistakes. The idea of paying tens of thousands of dollars for your or your child’s education is intimidating, and that’s why so many people put it off. Even if you can’t save the entire amount your matriculating mastermind will need, every little bit counts. Saving $25 a week — think of what you spend on lattes and muffins — over 18 years will add up to $41,394 at a 6 percent interest rate. If you haven’t started yet but you have eight years to go before college starts, $25 a week will give you $13,256. 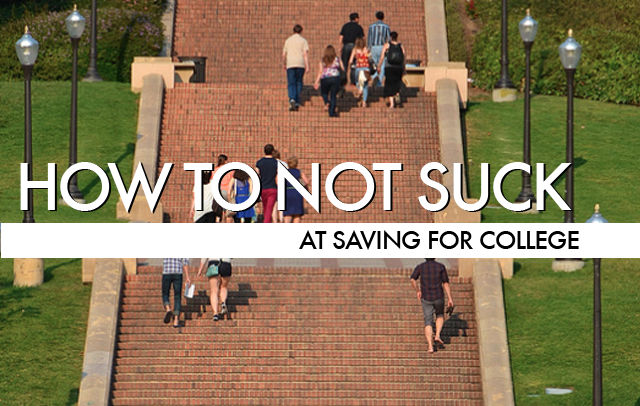 Even if your student is already a college freshman, there’s still time to save. A $25/week set-aside over two years will give you $2,600 — without counting any earnings from investments. That’s more than you’d have if you saved nothing at all. Older generations depended on savings bonds or Uniform Transfer to Minor Accounts (UTMA) for college savings. The interest from EE Savings Bonds is tax-free if the proceeds are used for qualified education expenses, but the low rate on bonds doesn’t make them all that attractive. The appeal of UTMAs is that the first $1,000 of earnings is tax-free, the second $1,000 of earnings is taxed at the child’s rate and anything above that is taxed at the parent’s rate. In a 529 savings plan, the money you invest grows tax-deferred, and if it’s used for qualified education expenses, the money comes out tax-free. Every state has its own plan — some offer additional tax incentives for in-state investors — but you can also invest in any out-of-state plan. You can look into pre-paid 529 plans, too, which essentially allow you to buy future credits for certain colleges at today’s tuition prices. Most 529 plans also offer an age-based investment option. For these, your money is automatically invested more conservatively as college gets closer in time, effectively putting your asset allocation on auto-pilot. If you used an UTMA instead, you’d have to monitor your investments to make sure the stock market doesn’t tank when your student is a high-schooler. There are other major disadvantages to UTMAs. These are custodial accounts, so when your child turns the age of majority (18 or 21 in most states) he controls the money. If he chooses to use that cash for a Corvette or a tricked-out Mustang instead of a college education, there’s nothing you can do about it. By comparison, if your child decides not to go to college and you have a 529 plan, you can change the beneficiary of the plan to other family members — future grandkids, maybe? — and even yourself. To learn more about 529 plan options, try SavingForCollege.com’s savings options comparison calculator for a side-by-side evaluation of different types of plans. Whatever kind of savings vehicle you use, the titling of the asset — who is listed as the owner — is critical. That’s because financial aid formulas count a student’s savings more than a parent’s. It’s expected that 20% of a student’s savings is earmarked for college, while only 5.64% of a parent’s savings is considered to be set aside for tuition bills. For that reason, it makes sense in most cases for the parent to be the account owner and the student be listed as the beneficiary. Financial aid formulas are another reason why most financial planners recommend using a 529 plan in the parent’s name rather than an UTMA, which is in the child’s name. Grandparents or other relatives can be 529 account owners, too, and those won’t show up on financial aid forms at all. Not all college savings accounts are created equally. What you pay for account management — the fees — could cost you thousands of dollars, a little bit at a time. For example, a typical 529 plan sold through a state has an average annual fee of 0.69%, according to the Financial Research Corporation, while those sold through brokers carry average annual fees of 1.17%. That may not seem like much, but if you invested $10,000 over 18 years with a 6% return, you’d have $2,000 less if you invested in the plan with the higher fees. That’s a lot of pizza and textbooks.